Toucans, such as this Red-breasted Toucan, fascinate birders and non-birders alike. Imagine what it must have been like when European scientists laid eyes on a toucan for the first time. The bright feathers drew universal admiration. But the bill was another matter. Theories abounded about its function. The most influential natural historian of the late eighteenth century, the Count de Buffon, argued that the toucan demonstrated nature’s unboundedness. Buffon believed that in its monstrosity, the toucan is definitive proof that nature is bigger — and stranger — than any of us. 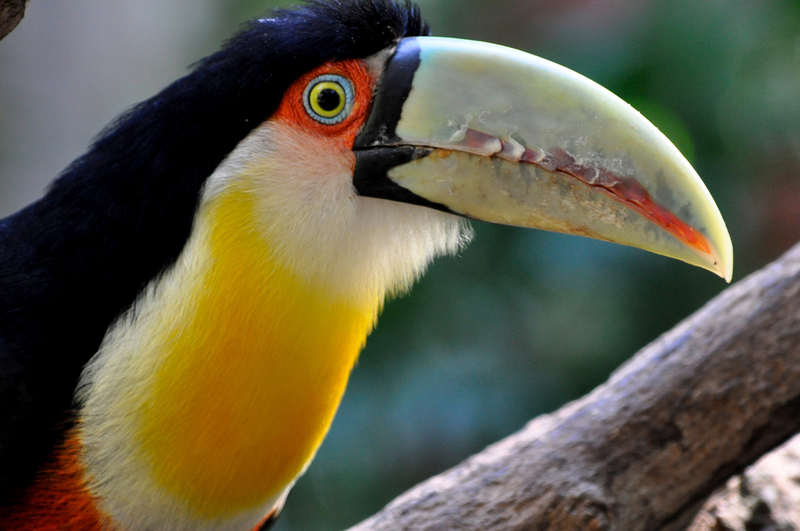 Toucans fascinate birders and non-birders alike. Theories abounded about its function — for defense, for picking fruit, for hacking out nesting cavities — but many observers simply assumed that the toucan’s bill was a burden, combining disproportion with uselessness. The most influential natural historian of the late eighteenth century, the Count de Buffon, agreed. But he went on to ask why such a creature should even exist. His answer was surprising: The toucan, he argued, like other freaks of nature, was created as proof of nature’s unboundedness. Its weirdness is proof that the creative force is not restricted by human ideals of proportion or regularity. In its monstrosity, the toucan is definitive proof that nature is bigger, and stranger, than any of us. Bird sounds provided by The Macaulay Library of Natural Sounds at the Cornell Lab of Ornithology, Ithaca, New York. White-throated Toucan  recorded by Curtis A Marantz.